It was a drizzly morning when we all met in the car park at Crayside Gym 09.15 for a departure at 09 30 was the time set by Judo Mike when he.arranged this excursion to the seaside. Tony did his usual trick of turning up last and acting like he had all the time in the world! Lillian never made it as for some reason she thought the meet time was 09.00 and had been and gone by the time we all got there - we're thinking of buying her a diary tor Christmas. So 14 of us set off about 09.30 with me driving and judo Mike directing operations. The weather stayed dry as we drove down the A2/M2 and onto the Thanet Way and we arrived on the seafront at Herne Bay at about 10.30. After some confusion (in Guy's mind - he couldn't tell the difference between a vehicle towing a boat and a minibus) about where we could park, we found a car park with space for the minibus. Phil's photo suggests we arrived in a BIFFA Truck - we did NOT'! We parked and walked through the streets down to the front, leaving 3 ladies behind who couldn't wait for a coffee! 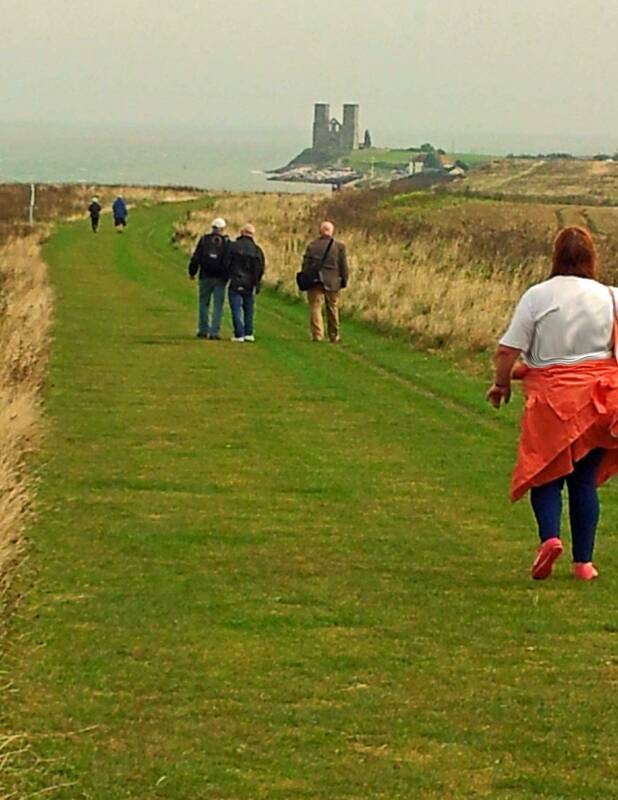 We then set off along the front with a view in the distance of the twin towers of Reculver which was our destination for lunch. We battled rain showers, hills and wind to walk the 3.7 miles to finally arrive at the King Ethelbert Inn ...... here we would all regroup for lunch. Eventually we all arrived and sat down to lunch. Taxi (BIG) Dave showed us how it's done by not only sinking a large portion of steak and stilton pudding with plenty of vegetables etc. closely followed by 3 pints of Guinness but then proceeded to walk back faster than any of the rest of us! (Phil suggested he had been caught short and desperately needed the facilities back in Herne Bay!"? 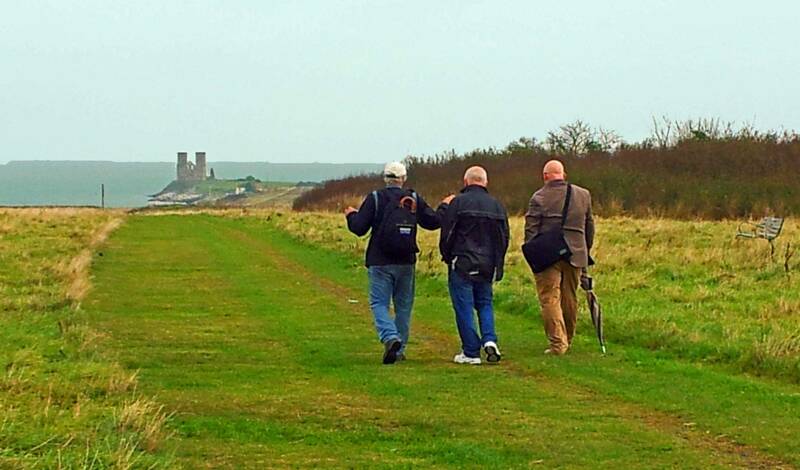 After lunch we prepared to set off back to Herne Bay - again we could see the "finishing line" from where we were in Reculver. The afternoon turned out dry, sunny and quite warm and we started back with a long uphill walk. Those of us who followed Taxi (BIG) Dave's lunch consumption, found ----- hard work. The 1st group arrived back at the Herne Bay pier cafe at about 15.40 and settled down in the sunshine to a well-earned coffee and a rest while we waited for the stragglers. 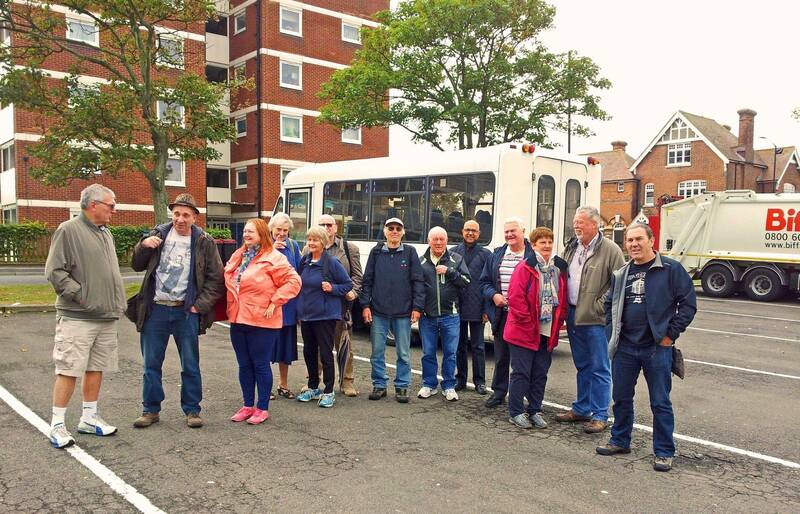 The last group arrived looking tired but obviously proud that they had completed the 7.5 mile round trip without resorting to the local bus service as had been suggested several times by Phil. He recalled that such a service had often been used by him and his mates in the past when doing (or NOT doing) school cross countries. They were soon cooling their overheated bodies with one of tile largest ice-creams cornets I have ever seen (and they assured me that that was only the medium size option). We all felt quite puffed out except for John (Herr Flick) who was still able to talk non-stop. John won an award for talking continuously there and back - apparently Helen told him that you use 5% more energy if you talk while exercising!! - from Nordic Walking studies. Phil intends to have a serious word with Helen on our return !! 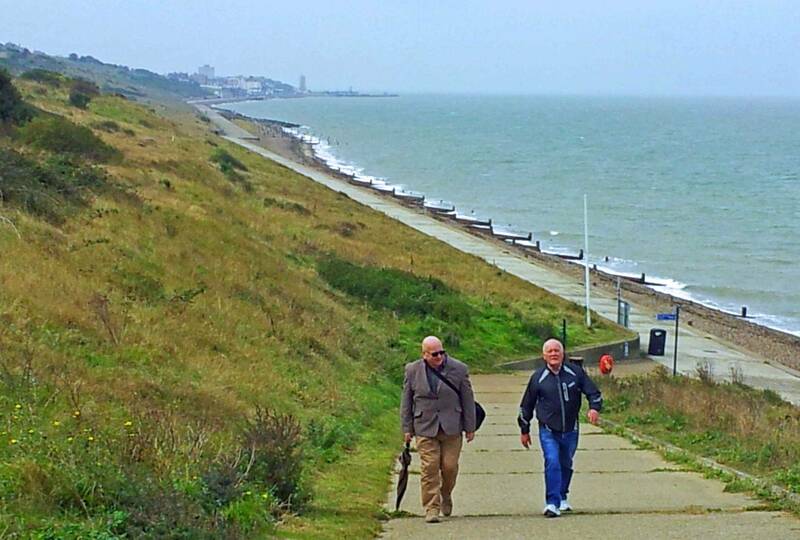 At about 16.15 we set off back to the minibus and left Herne Bay soon after on our way home. We arrived back at the Black Prince junction on the A2 only to then find a queue of traffic virtually all the way to Crayford which therefore took us some 45 minutes! We arrived back at the Gym car park just after 18.00 and everyone hauled their stiff limbs off the bus and into their cars to go home. Another successful AoH day out!